Clemente Hernandez, 45, is accused of trying to run over and kill another man in Westbrook in October. A Westbrook man accused of intentionally hitting another man with his SUV in October has been charged with attempted murder. Clemente Hernandez, 45, is being held at the Cumberland County Jail on $25,000 bail. Prosecutors originally had charged him with lesser crimes, but the Cumberland County grand jury handed down an indictment Friday on the more serious count of attempted murder. 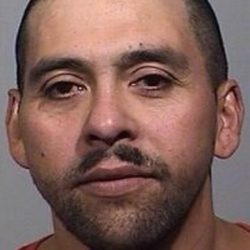 Hernandez also faces two counts of aggravated assault, reckless conduct with a dangerous weapon, reckless conduct and leaving the scene of an accident involving personal injury. He has not yet entered a plea to the charges. Hernandez’s defense attorney said the attempted murder charge is not supported by the evidence she has reviewed. “The District Attorney’s Office is going to have a sincere problem in establishing that my client intended to kill anyone,” Tina Heather Nadeau said. Hernandez has lived in Maine for a long time and has a strong work history in the state, Nadeau said, and she hopes bail soon will be lowered so he can be released while he fights the charges. According to police reports, Hernandez was driving a 1999 GMC Suburban on Oct. 18 when he spotted the victim walking near Pennell Street in Westbrook. He allegedly veered over a curb and struck the man, leaving a dent in the hood of the vehicle. Police believe Hernandez was angry with the man because of his relationship with a woman. The victim told police the last thing he remembered was hearing screeching tires. When he woke up, he was on the ground, face up on his back, and he “hurt all over,” the police report said. Court documents show the 25-year-old man did not sustain any broken bones or life-threatening injuries. Hernandez denied being in Westbrook and said he was in Old Orchard Beach, among other places, when the crash took place, police said. But police obtained a search warrant for Hernandez’s cellphone records, and say they showed that his phone was in communication with cellphone towers in the Westbrook area, not in Old Orchard Beach. Police also said multiple witnesses described someone who fit Hernandez’s description.